Wrapping up her day’s work in an office that combines the professional (degrees, medical reference library) and the personal (a carving of a moose atop an oiled cedar-slab table), Case sat down with a mug of tea to talk about just why she’s committed her life to a practice that’s wildly different from your average city veterinarian. Dr. Case, center, works with two Northwest Trek staff members to examine a new lynx in the Animal Care Clinic. Why did you become a veterinarian in the first place? Allison Case: Well, it’s like going on a hike. You know of this cool trail, maybe you’ve never been on it before. But as you’re on that trail, you discover there are so many different ways of enjoying it, so many different and interesting paths. During my childhood, in the 1960s and ’70s, I was profoundly moved by the work of (primate conservationists) Dian Fossey and Jane Goodall. I was also inspired by Jacques Cousteau, but there was a concern about me diving. So I turned terrestrial. I loved being outdoors. I grew up in Dallas, Texas, playing in the backyard and occasionally at a family farm. I was lucky enough to grow up with horses, training and showing them – that kept me outside and dirty and working hard. I was impressed by the intelligence of animals. I was also lucky enough to ski winters in Colorado, and spend nearly 25 summers at my grandparents’ house in Montana, fly fishing with my grandfather. All of that led to me being outdoors. Did you study veterinary medicine immediately? AC: Actually, no. At the beginning I was into wildlife and endangered species conservation. For eight years after my bachelor’s degree I worked with the Colorado Division of Wildlife as a research assistant, neonate rearer and animal trainer. I worked for veterinarians who had Ph.D’s in wildlife ecology, assisting them in field research while also caring for wildlife at the Foothills Wildlife Research Facility. During those years I completed a second degree – an Associate in Veterinary Technology – and worked as a veterinary technician. That’s when I knew – I was not stopping there! I went to veterinary medical school and began walking that trail. In vet school we specialize, just like human doctors do, and for me zoo medicine was what I was really drawn to. Some of the best scientists are working in zoos, and I loved the close partnerships between zoo vets and wildlife vets, all working together to help animals in the field. Where did you work before you came to Point Defiance Zoo and Northwest Trek? AC: My post-doctorate training in zoo medicine was at Indianapolis Zoo. I was also one of several veterinarians working at a large elephant conservation center in Florida. Lastly, I was a veterinarian at the Detroit Zoo before moving to Washington. 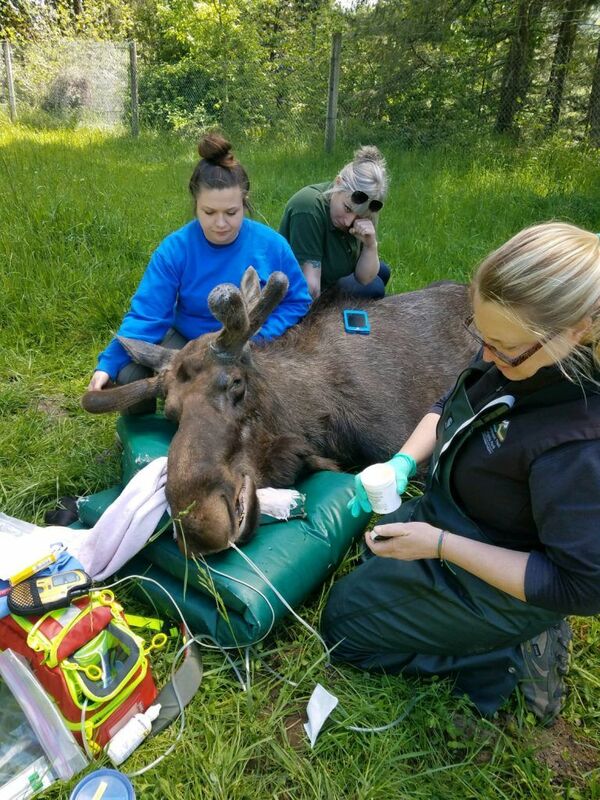 Dr. Case, right, prepares for a procedure on a moose in the Free Roaming Area at Northwest Trek. So tell us exactly what you do here at Trek – what does a typical day look like for you? AC: There’s no such thing! And no such thing as thinking you might know what’s going to happen on that day. Sometimes I get here early in the morning to join the keepers for a huddle. Other times I start the day planning with my veterinary technician for a (medical) procedure. The core of what I do is wellness and prevention medicine, and for that I do a lot of observation and listening to keepers. Unlike a human patient, you can’t get verbal feedback on symptoms or treatment. And it’s not like a domestic dog or cat, which you can handle without anesthesia. The smallest segment, and the most intense, is caring for geriatric animals, or those with bigger medical issues. That’s challenging, but those are awe-inspiring times with the level of care and caring from everyone on staff. We don’t hold back. What’s the biggest difference between your job and the average city vet? AC: The 435 acres of our Free Roaming Area with over 100 wildlife animals! Procedures that would normally take place in a quiet hospital room happen outside, whatever the weather. We load up our field totes and go out! Even a routine exam starts with darting an animal to initiate anesthesia. I’ve spent 26 years on the ground, on my side or belly, working with animals. My clinic is out there, in the rain, shine or snow. AC: The Pacific Northwest was really new to me – it’s all about being waterproof! I wear a thick PVC coverall bib with a raincoat. But I’ve never minded the elements – because of my wildlife background I think I was a perfect fit here. What’s your greatest challenge in this job? AC: I would say caring for myself. I spend all my time caring for animals. And what do you like best about it? AC: The animals themselves. Even at my age, there’s still a constant sense of wonder and amazement about them, and the people who work with them. I’m learning every day. AC: Well, yes, I was lucky enough once to spend a year playing on a ski mountain! I still love to ski, and fly fish. I’m addicted to stand-up paddleboard. And I had always dreamed of sea kayaking – once I moved here I fulfilled that dream.